This is a post from the perspective of me, Ville (the drum guy), on our two gigs in Synapsi with Hocico in August 2014. The diary includes lots of technical stuff, which might be out of the interest-range of many people – all the technical mumbojumbo is therefore written in italic. Unzyme played at Synapsi for the first time in 2010. Four years later it was time to redo the show, this time in Tampere and Helsinki on two consecutive days. We had the honour of playing with the legendary aggrotech band Hocico. Drills began at the Unzyme Proving Ground in Jyväskylä a couple of days before the gigs. There was quite a bit of technical issues to attend to – first day of preparation lasted seven hours, during which we had the time to rehearse only a single song. We had the feeling that the intro was a bit too long, so we decided to shorten it by 30 seconds. I had the audio files and the Ableton Live project files for the intro buried somewhere on the hard drive of my old computer. Luckily, after some searching I was able to recover them. The lighting sequence also had to be recalibrated to fit the shortened intro. We also made an updated backing track for Mother of All Bombs and did some rerouting of the audio hardware, which eventually turned out to be a bad decision. Also lots of tweaking on the drum sounds and adjusting the sensitivities of the V-Drums’ midi pads. I was also able to add a new cymbal pad to my kit, which really made playing more enjoyable. We hit the road to Tampere on Friday around five o’clock, since we couldn’t obtain our rental trailer any earlier (there were also some issues with trailer lights, so we had to change the trailer at the last minute). We knew it was going to be a hassle getting the soundcheck done before the doors of Synapsi were opened, so we had to hurry quite a bit. When we arrived at the scene, Hocico had already done their soundcheck and the sound technician was anxious to get started with ours. We quickly set up the machinery and started the check. Drummer’s perspective of the Tampere event. 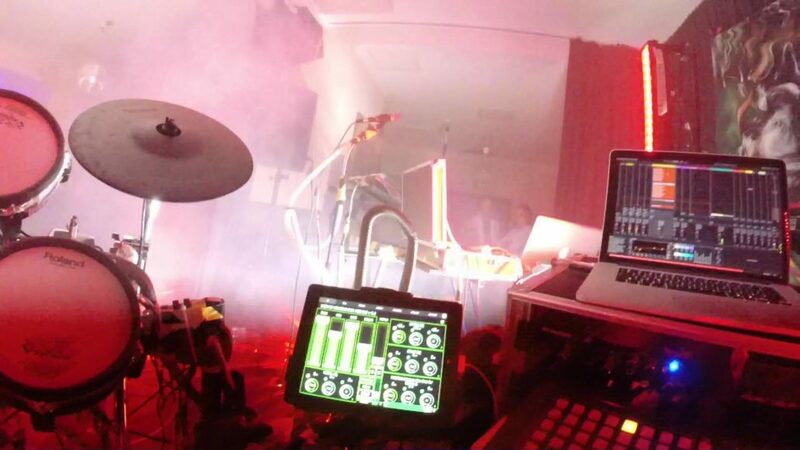 IPad running Lemur, Ableton Live with a dark skin, and a part of the APC-40 are visible. There was no sound from the backing track. We checked all the connections and restarted the computer and the sound card, to no avail. Eventually, we replaced the backing track audio cables and we got the sound through. Faulty wires, yay. Then it turned out that there was a weird crackle coming out from the left keyboard channel, so we decided to run it mono from the right channel. And then there was the monitoring issue. We had changed the setup so that I receive the monitor audio to my headphones via an XLR cable from the mixing desk, instead of doing the monitor mix completely using my computer and headphone amplifier, as I had done before. Unfortunately, with the new setup, all I could hear was the sound of Joona’s microphone enhanced by a terrible peaking overdrive. We tried inserting a -20/-40 dB pad in between the desk and the headphone amplifier, but this didn’t help either. We tried quite a few things, but nothing worked. I decided to listen to the click track (coming from the main computer) with my right ear and drop the headphone from my left ear, so that I would hear the stage monitor. Well, turned out that the stage monitors didn’t work either. Five minutes before opening the doors to the event, it turned out that there had been some confusion with the monitor setup. They were quickly redone, but we practically had no time to do any monitor mixing. Shite, I thought and proceeded backstage to consume peanuts. The gig started a few hours afterwards. 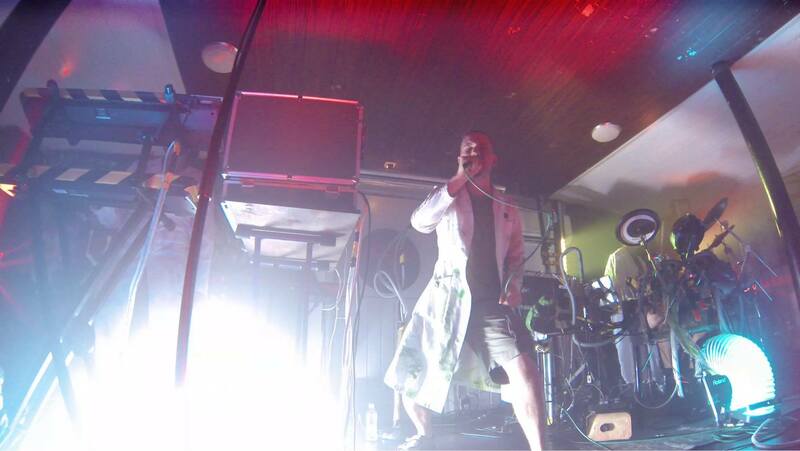 The intro track spun into play and the familiar green glow of the lighting system illuminated the stage. Everything seemed to be going well. At the end of the intro I began mixing in the backing track of the first song, Relay, using an A/B fader and a low-pass filter on my APC-40. I slowly brought the tempo up to around 140 bpm. As the backing track was on its last beat of its verse, I launched the Relay song scene from Ableton Live, which settles the tempo to 140 bpm and also initiates the lighting sequence. On this track, I start playing the 4/4 beat immediately. As I did, I realised in horror that I could not hear any drums. Nothing_at_all. I threw a confused face at the audio engineer, but couldn’t see any trouble in his eyes. I also noted people were slightly, if not very profoundly, dancing. I figured the monitor mix was even more horrible than I had imagined, but the main mix must have been OK. As I concentrated harder, I could feel the distant thump of the kick drum buried under the mountain of noise from the backing track. For the rest of gig, most I could hear was the click-track and the horribly-clipping backing track from the stage monitor accompanied by a distant echo of Joona’s voice. Joona and Mary said they mostly heard only the backing track as well. On top of that, they don’t get the click-track to their ear, so it must’ve been interesting to keep up with the beat. We struggled through the set and to our surprise, people actually liked the show. There was quite a bit of (drunken?) dancing and later, when I asked about the sound, I was told it was quite clear and that show was very nice. I guess that’s the only thing that matters. Can’t say I thoroughly enjoyed my 45 minutes of click track, though. Moving on to Helsinki! We stayed the night at my brother’s place in Tampere and set off to Helsinki early enough to avoid the issues we had in the day before. The gig was played on a boat called Wäiski. The stage was slightly larger than the one in Tampere. There were quite a lot of events on the boat that evening, and the ship staff got a bit frustrated about Hocico’s soundcheck (“When is this soundcheck over?!”). Apparently the cider-sipping summer terrace people didn’t appreciate the aggressive industrial music. For the Helsinki gig I decided to reroute my monitoring. Instead of running an XLR from the mixing desk, I ran the backing track and the drums directly from the computer to my headphone amp. I also connected Joona’s microphone to the same apparatus (the amp conveniently provides an undisturbed through-connection for a microphone, just for this purpose). Finally, I ran Mary’s keyboard signal to an input channel in the M-Audio Profire 610 and routed it to the amp. Previously I had done the monitor mix by creating a return track in Ableton Live and adjusting the mix using send knobs. The return would then output the signal to the headphone amp. This time I used Profire’s own software, which, IMHO, allows for more handy interface (I might return to the Live format eventually, since I just had the idea of mapping the send knobs to my APC40). 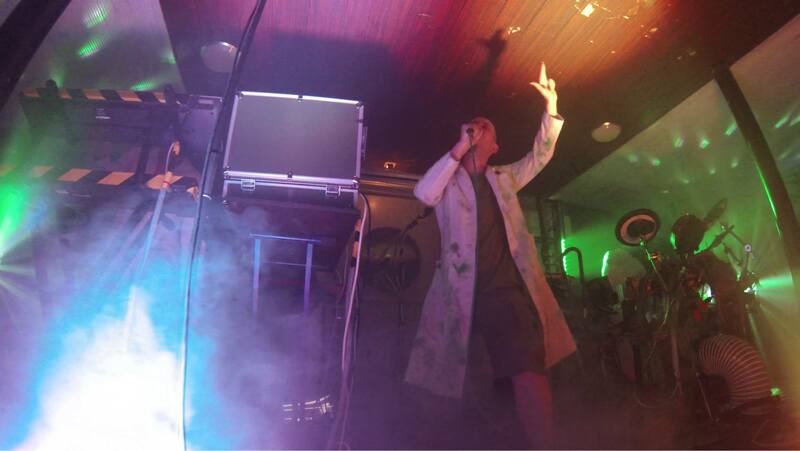 Unzyme performing at Synapsi in Helsinki 2.8.2014. The blue tube on the kick drum on the right is illuminated each time I hit the kick. The Helsinki gig itself went by the book and with perfect monitoring. We had decided to make the show a bit shorter to deliver a tighter and more uptempo package, so I didn’t really give Joona time to breathe or drink water between songs – almost as soon as a song was over I would queue the next one and launch it a beat later. We played eight songs in 32 minutes, which is probably the tightest schedule we’ve had so far. Feedback after the show was positive and especially the lighting setup was praised. There was only 30 minutes to clear the stage after the show before Hocico was going to start. We had optimised clearing the stage for this purpose. The lighting system is the hardest part. It consists of nine separate fixtures. Each fixture is connected to two other fixtures, so that the DMX signal and the electricity travels through the whole setup. Tearing such a system down to bits after a gig is out of the question, so we package the whole setup as it is in a big box. The procedure was practiced over and over at our training premises and we got the disassembly time down to under three minutes (previously, we had only seven lights, which we assembled and disassembled during each gig – this took around 20 minutes). From ending the show to having all the stuff in the trailer took around 30 minutes. Thankfully we made it, and mostly due to help from numerous people who carried the stuff with us. All in all, the Synapsi weekend was much fun. Hocico is pretty awesome live. They truly know how to engage the audience. We have a lot to learn from these pioneers, who also turned out to be very nice people. I hope we get to do stuff like this more often. On Sunday we rewarded ourselves by spending the day at the amusement park Linnanmäki, yaay! To streamline the setup process, invest in a DI-box rack and the necessary (working) cables. Book the trailer/van in advance to make sure you get there in time. If you require in-ear monitoring from the mixing desk, have a back-up plan of doing the monitor mix from your own system. Also have a major back-up plan if everything fails. It’s still better to have an iPod with karaoke-versions of the songs than not to play at all. Always have have backup energy drink to avoid two kilometers of aimless strolling in Helsinki to find one before a gig. Man, you really need to make your setup fail-proof and way simpler. An opener coming late to a venue only to mess around with cables and settings… Ok, that was maybe a bit harsh – you cannot be prepared for everything after all. But still, I would suggest you go back to the setup where you have your monitoring on laptop, and only have vocals through your stage monitor. If it’s absolutely essential to have vocals in your headphones, route only the vocals via the mixing console to your audio interface and mix it with the laptop tracks on the computer. Or, better still, buy one of these (http://www.thomann.de/fi/cae_90074_yaudiosplittkabel.htm) and split Joona’s microphone cable already on stage so you do not need to bother the sound engineer with unusual routings. One option is always to hire your own engineer; many house-engineers are somewhat reluctant to start fiddling with artists’ in-ear monitors. It seems that your setup is also rather complex mix-wise, so it might be a good idea to have your own sound engineer on board who knows how everything is supposed to sound. Until then, your best bet is to run with 1 or 2 stereo channels out from the stage, including keys, backing tracks and drums, most of which are already mixed together by you. Good points LSFD. This was actually the first time we tried to do the in-ear monitoring from the mixer’s end (outside our training premises) and we should’ve been better prepared. For the Helsinki gig we did what you described and setup all the in-ear monitoring from the main computer (including vocals, which we split on stage). We’ll stick to this in the future. Originally, we had all the channels mixed to a single stereo pair, as you suggested. We could then mix the audio to sound fine on our training premises, but this wouldn’t of course reflect well on a real stage. Such a setup could be virtually mixed, if we had a midi mixer or if the engineer was willing to run frantically on and off the stage. I believe having multiple outputs is the way to go, since the engineer can use the tools he/she is used to. Of course this makes things more complicated when setting up the stage, which is why we’re now employing a DI-box rack with all the necessary cables, so everything can be hooked up to a stage box as quickly as possible (and still, it’s only six XLR-cables + vocals). Making things more simple is tempting. An extreme case would be to have everything but the vocals as playback. This is quite often the approach followed by electronic acts and there’s nothing wrong with that. However, we want to maintain the level of actual playing high enough, and this obviously brings in complications. Still, I think we’re far from the general rock band, setup-wise. The drum kit, for example, requires no miking or whatsoever, whereas a “regular” setup would call for miking each individual drums and mixing the whole thing to sound good. All in all, in a broader scale, I don’t think we should be too much trouble for an audio engineer. I definitely agree with you in making the system fool-proof. We’re going to add a backup system, so if all else fails, we’ll still have something to go with. Hiring an own engineer would be awesome and we’ve talked about it. Money-wise it might be a bit complicated at this point, but hopefully we’ll get to do it in the future. We’re not professionals at this and are constantly exploring possibilities, so any further tips like these highly are welcome!